Yep, that's right: sheet music. I was on a kick there for a while where I was buying tons of sheet music for my collage pieces. I loved the way the orderly fashion of the lines and the clefs and the notes helped to anchor the chaos of my pieces (chaos because I didn't know what I was doing, not because it was some sort of well planned artistic vision!). 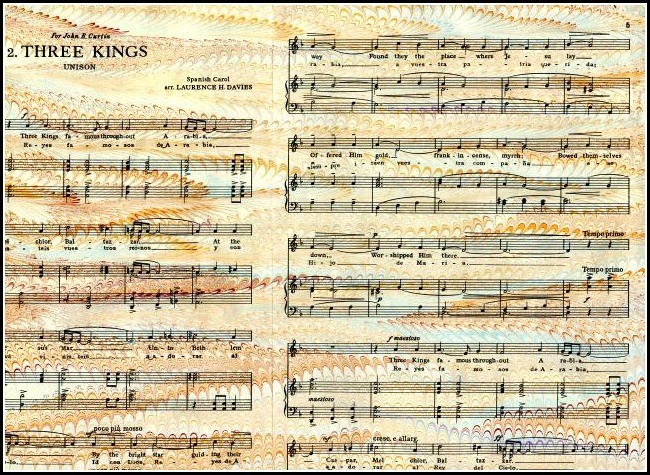 I simply adore the look of sheet music. Despite not playing an instrument or being able to sing, I find sheet music to be so warmly inviting. Maybe it's because I love a good story and the notes and various musical symbols on the page tell a story just as much as words and punctuation do. 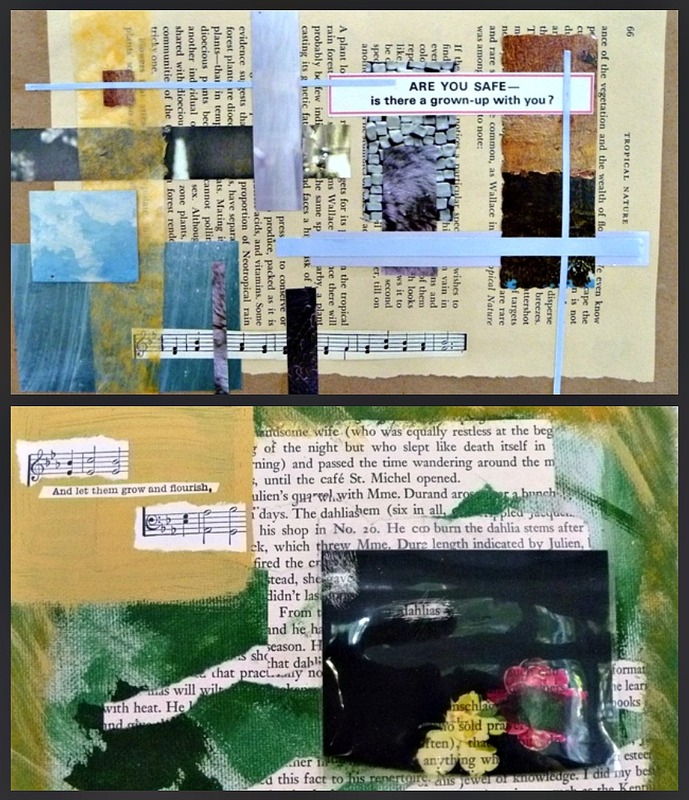 Anyway, my verve for collage has waned slightly (with the whole marbling thing occupying my passion of late) but my adoration of sheet music hasn't. The other day as I was rearranging my inside studio, I came across my collection of sheet music and thought...hey, this may be fun to marble over. Marbling and sheet music go hand-in-hand like peanut butter and chocolate--independently, they are delish; together, they are magic. 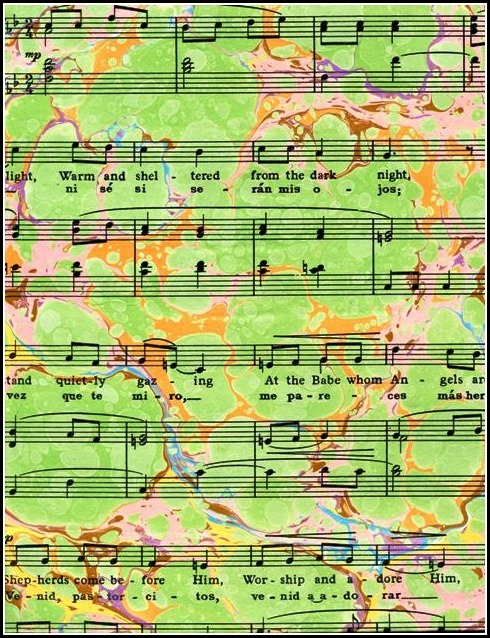 Marbled sheet music seems to SHOW what the sheet music wants you to HEAR, instruments be damned! 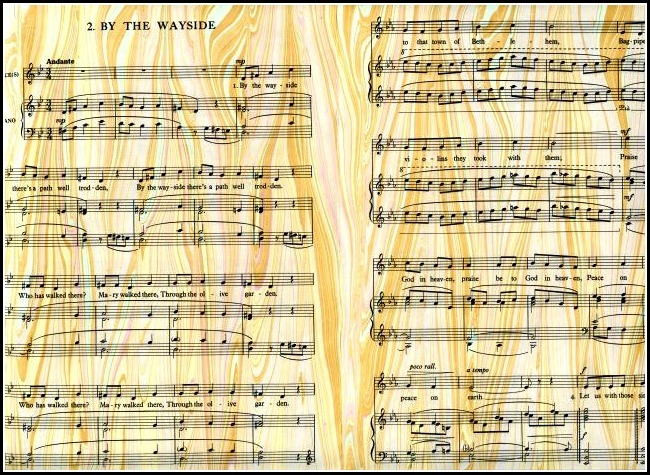 You can even affect the way the song is interpreted by the marbled patterns and colors selected. I'll be using these pieces in some of my journals (they make for gorgeous signature wraps!) but I also think they would be FABULOUS as backgrounds for all kinds of artwork from collage to sketch to even scrapbooking. So if there are any artists out there wanting to experiment with me on a marbled sheet music + another art form collaboration, let me know!